GHI’s roof trims are made from durable PVCu which is low maintenance but highly effective, installed with a special ventilation system to protect your roof and walls from water and damp. 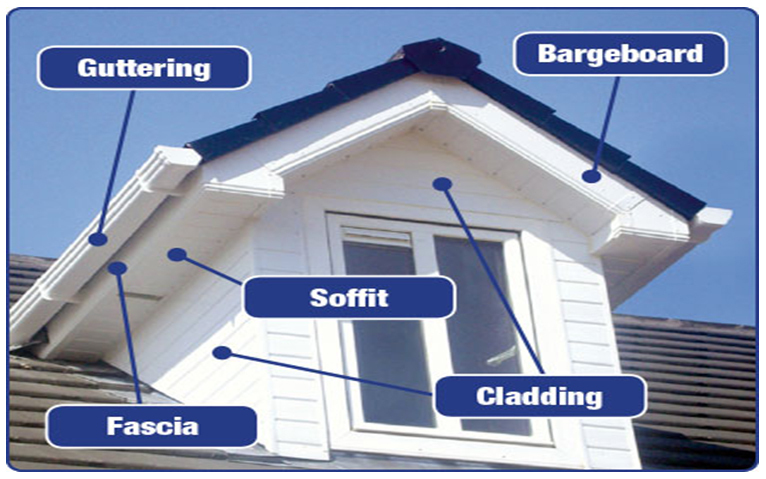 Your fascias and bargeboards are probably the most noticeable feature of any of the roof trim range. They are not only aesthetically pleasing but have a hugely important role to play in protecting your roof from the elements. GHI’s fascias perfectly conceal and protect the ends of your roof rafters, giving your roof a crisp, clean appearance with no unsightly gaps or holes. Our PVCu soffits are designed to bridge the gap between your home’s siding and roof edge, they are responsible for protecting the underside of the roof overhang, whilst completing the overall look of your home. Durable and made-to-measure for an exact fit our soffits will look clean and attractive for years to come, being low maintenance means no more climbing ladders to repaint every year. GHI understands blocked or leaky gutters can be costly to repair, the damage they can cause to your home can be substantial. That’s why GHI’s PVCu guttering is expertly designed to protect your property from even the heaviest weather. Available in three profiles, square, half-round and ogee. An effective rainwater drainage system is imperative in the protection of your property. Installing quality GHI downpipes channels rainwater away from the property and safely drains it away. GHI can supply square or round downpipes to suit any style of property. We can create a cast-iron effect which is ideal for the more traditional homes and we also have contemporary colours perfect for today’s modern properties. Bargeboards are a strong decorative board located at the gable end of the roof, they are designed to both protect and conceal the roof timbers of your home. GHI’s bargeboards will keep your roof lining dry and damp free, with a smooth clean appearance and no unsightly gaps or holes. Our Bargeboards are made up to 25mm thick for increased durability, and we only use stainless steel pins and nails with polymer caps to ensure no rust stains appear. Our bargeboards are available in a choice of five colours – white, mahogany, golden oak, rosewood and ebony – to complement any style of home from traditional to modern. Even the smallest details have been thought out so our pin-heads are colour-matched making them barely visible. PVCu cladding can enhance and refresh the appearance of your home, It provides an attractive, low-maintenance and weather-resistant solution for replacing rotten timber cladding, concealing problem areas of brickwork or adding an interesting new feature to your property. However, if weather damage causes cladding to rot, the effect it leaves is far less attractive. That’s why GHI’s cladding has been designed to be exceptionally durable, attractive and resistant to even the worst weather.